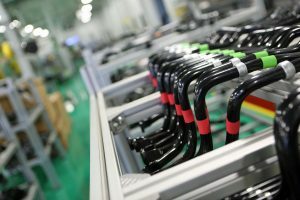 In a business like New Mather Metals—particularly one that manufactures safety-critical automotive components—the only superlative to having a genuine quality and safety culture, is having structured QC elements hardwired into production routines, proactively applying that culture to process every single day. At the heart of New Mather’s methodical quality imperative is the company’s Total Productive Maintenance (TPM) protocol that brings engineering and production associates together with maintenance technicians—every day—to closely evaluate the performance of automated and other production equipment. In New Mather’s experience, TPM protocols are essential to the process of ensuring optimum reliability and quality consistency. Because communication is the only way to ensure the best ideas drive the manufacturing and QC process, New Mather Metals also holds fast to a regular clockwork schedule of team meetings. Cross-functional Obeya (or “war room”) meetings facilitate an optimum level of productivity, quality and efficiency by preventing “departmental think”—a manufacturing trait notorious for promoting assumptions that cause mistakes and redundancies that cost money. Weekly quality meetings bring representatives from each department together—on the production floor—to exchange information regarding process, share insights and solve problems. New Mather Metals maintains key safety and other quality checks along the assembly line, throughout the process. This enables production to take the most cost-efficient path to quality assurance by addressing defects immediately, before they manifest themselves in high volume, while expediting throughput to stay on schedule.